As I posted last week, this is the beginning of "ANNUAL SEASON", that time of year when no visit to a larger newsagent or bookshop wasn't complete without perusing the copious number of annuals on sale. Today's house ad, from November 1974, plugs MARVEL UK's three 1975 cover-dated offerings: MARVEL, THE AVENGERS and SPIDER-MAN. SR, thanks for that - November '74 is the very month I started reading Marvel comics so that advert must have appeared in those first issues. 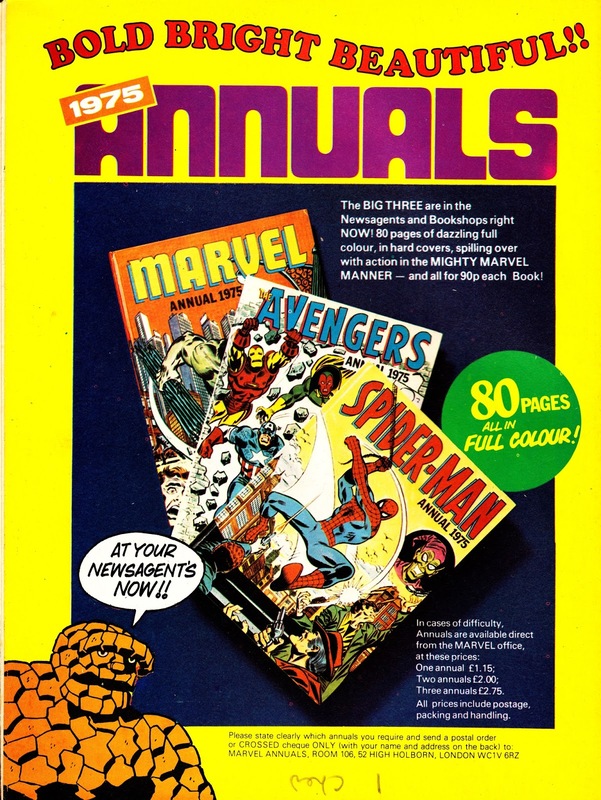 I remember getting the Avengers Annual on Christmas Day 1974. It's one of those books that I read again and again until the front cover board almost came off. Well loved!